My husband and I are building a tiny house on wheels: a 131-square-foot home that we hope to move into by mid-2015. I’ve embarked on interesting adventures and worked on cool projects before, but have never done anything quite like this. We gave most of our furniture to a friendly couple who responded on Craigslist. (Do you know how many people will respond to your listing of free stuff? My goodness.) I’ve given bags of clothes to my uncle, who will bring them to the Philippines. I took a carload of boxes — small household items, kitchen appliances, more clothes, shoes, accessories, jewelry, and other useable stuff — to a community donation center. Our friends have picked up other pieces of furniture I’d listed on a Google spreadsheet and shared on Facebook. All items claimed. Crossed off. And oh, my books. We donated hundreds of books to the San Francisco Public Library, from paperback novels I collected when I worked at Barnes & Noble, to hardcover nonfiction I accumulated when I was a book reviewer at a newspaper, to art books from museums around the world, to dog-eared travel guides, to cookbooks never opened. We have a bookcase in our living room; they’re the most accessible shelves in our home, visible through the window to those passing on the street. I’d displayed what I considered my favorite books there, but I hadn’t even read half of them. I suppose I view unread books like the stories in my Pocket queue or the links in Instapaper I’ve not read: they’re a pretty display of the knowledge I already have, that I actually own, but haven’t had a chance to consume yet. With the exception of a few that really mean something to me, I shouldn’t feel so attached to these books. As I sit in my loft and stare at empty shelves, bare walls, and more boxes, I think about these things: How I’ve been tied to them for so long. How they’ve followed me from home to home. How I’ve considered them valuable. A few weeks ago, I went through shoeboxes of film photographs and negatives. Most were pictures taken with disposable cameras — dorm room hangouts, warehouse parties in San Bernardino and Oakland, past boyfriends. Some shots were from way back, like my first black and white photography class in eighth grade. As I dove in, I expected to have a hard time deciding what to keep. But even my photographs? I can’t possibly toss these memories. I enjoyed sifting through them, but threw away more than expected: Contact sheets from my semesters in Europe and Southeast Asia. Super 8 reels from my film production seminars. High school pictures — coming of age, documented. And many shots of me, family, best friends, and ex-boyfriends — people I am close to, or was close to. On the other hand, I was surprised by some photos I kept: snapshots of insignificance, of anachronism, of no value to me. Photos with acquaintances whose names I don’t recall or crushes from my first year of college. Pictures with strangers on dance floors. Moments I’ve forgotten — that haven’t been swirling and reshaping in my head all these years. I was more interested in these pictures, as they weren’t an active part of The Past. There are things that photographs capture; there are things you can’t replace; there are objects you hope to pass down to others — artifacts of history, of you. I get that. But I’ve kept so many photographs for decades because I’ve considered them “precious” — because they’re supposed to take me down memory lane. But some of these pictures aren’t all that special: they inadequately record moments already tattooed in my brain. Some might not agree, but I think they’re distracting and misleading — static visual byproducts. No picture can match the imagery in my head. Ultimately, they take up space. So, I kept some photographs and tossed the rest. I kept some books and donated the rest. I think about all of this stuff, most of which I haven’t touched in years, and question what I really need. As I think about our accumulation of things, I also think about the spaces we inhabit not just to house ourselves, but to hold these things. I’ve never been interested in having a big house, whatever that entails. My first place in San Francisco was a very tiny Russian Hill apartment, while our current loft is 720 square feet. While some people might consider this space — or anything under 1,000 square feet — too small, there’s more than enough room (and I actually think it’s too big). I often wonder what home is — what it’s supposed to look like. Is it a comfortable physical space we can call our own? Is it a state of mind? Is it one’s lifelong companion? When my beloved lived on the other side of the world, I thought that my physical home would be incomplete as long as he was away. Now that he’s here, this space feels more like home, but we’re ready to explore it further: What if we could redefine home so it fits our needs, and create a space that also allows us to do the things we really want to do? What would that look like? So, I’m excited to tell you about our new site, Tiny House Travelers, which will eventually become an online space for this tiny abode. If you live in a tiny house, or are building one (or thinking of building one), please let me know — I’d love to hear from you. Fascinating to read of your downsizing, giving away so much accumulated “stuff” and actually building a small house on wheels to take off for adventure in parts unknown. I’ve done similar downsizing and then “upsizing” over and over during my now-71 year lifetime and the process continues. Right now I’m cleaning out our garage and hoping to get rid of my present 82-year-old husband’s accumulated tools as he is no longer able to use them. We anticipate another major move within the next couple of years back to Winnipeg where we met and married 10 years ago before we got rid of both of our households and moved in a 35-foot motor home to Mexico for 2 1/2 years (buying and selling a house there) before moving north to British Columbia. One thing I’ve learned is that it is better to be on the move when you are young. It gets more difficult the older one gets. I assume you are a lot younger than I am and wish you Godspeed and many wonderful adventures. Yes, home is really wherever you are and home is what you make of it. Of course, it is even better when a special loved one is at home with you. Awesome — you’re further along that we are, so we might have to look to you for the ideas 🙂 Where are you located/do you have space/land to build freely/at your own pace? I am located in central CT. At the moment I am piggy backing off of my parents land while I save to purchase my own. I can definitely go at my own pace, have plenty of space and I have my father’s help, which will be key! I’d like to eventually find some secluded little slice of heaven, maybe in Maine or Montana. I’ll be posting along the way and hope to be done by this winter, so feel free to get ideas! Good for you Cheri. I live in Vancouver where the house prices are astronomical and many people are forced to live in smaller spaces. These smaller spaces are plenty big enough when considering where we spend most of our time when we are home. A favourite chair? Working at the dining room table? There maybe spaces we all never go into, so having to limit yourself to 130sq ft. will likely be just as fulfilling, provided that you maintain the atmosphere of that ‘favourite’ place. Good luck, and I look forward to seeing the result. Indeed, the relationship between freedom and “stuff” poses a challenge. With so much emphasis placed on individual identity, our memories and mementos can become too precious; they can constrict our spirit. A decade ago I scanned boxes of pictures. I haven’t looked at them since. Since our “purges” in the past several weeks, I’ve gotten addicted to getting rid of stuff. I’d noticed when we moved, there still felt like too much, even after donating/downsizing and shedding more than 75% of our stuff! Definitely feeling lighter, and it’s opening my eyes up to other things about myself and habits. So interesting. How exciting! Best of luck for your tiny house. Like others have said, I also have trouble getting rid of stuff (I recently posted about some of my collections..) but I’m sure it feels wonderful to have less stuff to think about, and to weigh you down. Sounds incredible. My Other Half would love to build a tiny house on wheels too. Although that ubiquitous Stuff would be more of a problem, as we never, ever, ever throw anything away. Well, rarely. We’d have to keep a main house for storing Stuff and wheel ourselves back to visit it from time to time. Good for you guys! I live in San Francisco and, while I love our apartment and neighborhood, I do dream of having a stand-alone house one day. I’ve held on to a copy of Small Homes Magazine for years now as inspiration, because we’d want to opposite of suburban sprawl. Looking forward to reading more about your progress! You are brave! I love tiny houses and someday hope I dare to live more simply. Great post! You are so totally awesome, Cheri. A tiny-house on wheels! And Tumbleweed – a fabulous name for a tiny-house-on-wheels! That makes me really happy. Also, you inspired me to bite the bullet and start a second blog. I’m nervous about managing them both; I’ll be curious to read your experiences as you juggle two (or more?) sites. Good luck, and I can’t wait to follow along. I’ve fantasized about tiny houses for a while now. Always debating if I could do it. I’ve spent the last few years living out of a suitcase, but always in friends apt. I really glad someone I “know” is doing it. I’m excited to see the process you take in building it, as well as the success and challenges you experience. If only I could visit and see it for my self! Wow, how do you feel? You must feel like a load off your shoulders. You should treat yourself to a message. Happy Nesting. I actually just met someone with a small square foot home–I’m posting about it this weekend. What an adventure you are about to be carried into and by: a house on wheels that sounds like a food cart it’s so small! I admire your gusto and strength of character to make such decisions. Envious but can’t wait to follow new blog! So exciting! 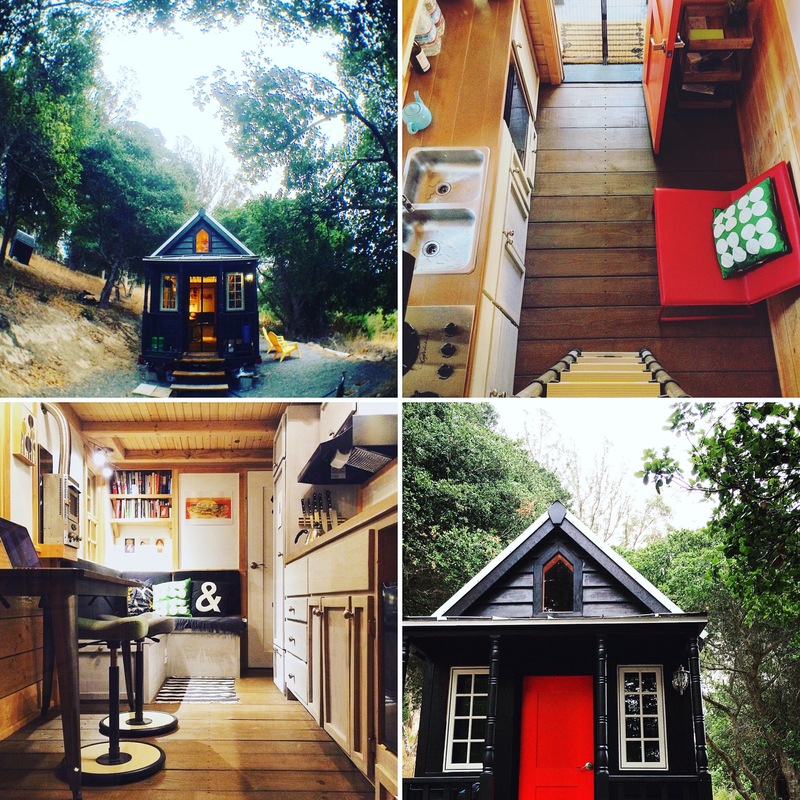 I’ve always dreamed of living in a tiny house (albeit a bit larger than 131 sq ft!) so I’m thrilled to follow along on this journey. Thanks so much for sharing it! 131 square feet! When it’s moving, it will be huge. I am reminded of two years my wife and I spent in New Zealand traveling in a VW bus. This was 75 to 77. We hand painted it, called it the Mustard and Pickle, carried a 70s vintage Sierra Designs tent to use as our master bedroom. LOL, still married! I’ve dreamt of owning a mobile home for so long. Over the past year I’ve seen so many tiny houses built on wheels and was so inspired by just the thought of it. It’s on my bucket list. This post is golden Cheri, I enjoyed reading every bit. giving up all those books sounds rough to me, otherwise this sounds like a great adventure! “No picture can match the imagery in my head.” So much truth in that one line. A timely post for me as we embark on yet another relocation/adventure in the coming months and as I do with each move, I simplify our life a bit more as I donate items we’ve lived without and those we’ve lived with but truly hold no value in our daily lives. Thanks for sharing your story. I look forward to following your new blog and ultimately your journey. I lived in a big house. There were two of us and two large dogs. Now we live in a small cottage with one dog. Small is sooooo much better. I moved from a reasonably large flat into a bedroom in a shared house. I’m still trying to get rid of stuff months later, with no real idea where to send it to. Not much fun! How is your move going? Wonderful post. Thanks for sharing and i cant wait to see your tiny house on wheels. I look forward to following you on your journey. I have similar piles of books and boxes of negatives, slides, super 8 film, family albums etc. but have not made the steps that you have made yet. My late mother’s favorite expression was: “We are all just pictures in an album”. Perhaps that’s why I have been hesitant to dispose of all those memories. I wish you both well as you embark on this next chapter in your lives. I live in a tiny house – 1041 square feet – or at least I thought I did until I came across your article! 131 square feet would probably be impossible. Looking forward to seeing what you do with it! This is so exciting! I love small space living. It really forces you to edit out all the unnecessary junk in your life we’ve all been conditioned to think we need. Look forward to following along! True, no picture can match the imagery in your head but what about something tangible to share. Looking forward to your exciting Tiny House build and adventures! Cheri, I love the assumption that underlies your decision to inhabit a tiny house: that things are not the priority in a life. Now that you can no longer drag them endlessly from place to place, you are forced to examine their relative meaning and importance. I’m betting you’ll have more than enough space for everything that you decide matters. I’ll follow your project with real interest. Like you, I’ve accumulated more ‘stuff’ than I possibly need to keep. The decades of minutia threaten to overwhelm me and I am slowly, weekly, weeding my way through all of it. It weighs me down when I wish to be weightless. I look forward to reading your new blog. I’m so excited for you. Great adventure. Cheri, I think it’s a wonderful concept and I myself hope to have a sustainable house sometime in the near future (I want it to be small, but going more in the direction of ecoconscious and permaculture than super tiny — I want to build it out of cob, mainly) … I also think it’s wonderful to get rid of the burden of things and the mindset of hyper consumption and accumulation that has overtaken our culture. However, I can’t believe you threw away pictures! My mother bought me a handmade wooden hope chest when I graduated from high school and it is filled with old love notes, pictures, trophies, journals and other keepsakes. Fortunately my father is hosting it in his attic so I have the comfort of keeping it without the hassle of storing it and lugging it around. I don’t know that it is serving a purpose to anyone but myself and I don’t know that I myself will go through it on a regular basis — but yet it’s comforting to know it’s there. And in the past when I’ve tossed out objects for the sake of simplicity and downsizing that were gifts or otherwise had any sort of sentimentality attached to them, I’ve deeply, deeply regretted it. But I’m sure you know what you’re doing and it sounds like a fantastic new adventure. I’ve thought of exploring this concept before as well — maybe via the mindset of a monk who has forsaken all material objects or through the lens of a person who lost everything in a fire, or by theft or natural disaster. To summarize — I love to get rid of clutter but it’s nice to be able to ‘cheat’ by shipping off everything I can’t bear to part with to a parent or two!! Now they have to store it, ha! I’m looking forward to this journey of yours! Can’t wait to follow your new blog and read more about your adventures in a small space. I clip pics of large houses for Pinterest and take open house tours whenever offered in my city. But for us? A small condo that sometimes feels too big — mostly because we haven’t given away enough of the stuff of our lives. Good for you to go through, cull out, and save what you love best! Thanks for sharing your transition with us! From 2015–16, I lived in a tiny house on wheels. I occasionally wrote about it here, but you'll find more detailed, practical information on my tiny house blog.